5 Takeaways From The Vice Presidential Debate : It's All Politics Neither Vice President Biden nor GOP Rep. Paul Ryan gave any quarter Thursday night. The two men were pointed and at some points personal in discussing their differences across a broad range of domestic and foreign policy issues. Vice President Biden and his Republican opponent, Rep. Paul Ryan of Wisconsin, participate in the vice presidential debate at Centre College in Danville, Ky., Thursday. Neither candidate let his opponent get away with much of anything during the vice presidential debate Thursday night. The tabletop discussion between Vice President Biden and Republican Rep. Paul Ryan of Wisconsin showcased their clear differences over policy. The two disagreed about nearly every issue that came up, whether it was military posture, tax policy or abortion. Many of these differences were expressed in negative, sometimes surprisingly personal terms. Ryan blamed the Obama administration for failing to do anything to address the nation's debt crisis, while Biden said Ryan bore much of the blame for deficits because he had voted to put two wars, the Medicare prescription drug benefit and sizable tax cuts "on a credit card." Biden pushed back against Ryan in ways that President Obama failed to do against GOP presidential nominee Mitt Romney in the first presidential debate last week. More than once, Biden brought up Romney's videotaped comments about the "47 percent" of Americans who lack personal responsibility. When it comes to entitlements, Biden said of the Republican ticket, "Their ideas are old and their ideas are bad and they eliminate the guarantee of Medicare." For his part, Ryan laid the blame for continuing high unemployment and a sluggish economy straight at the White House doorstep. "You have a president who ran four years ago promising hope and change who has now turned his campaign into attack, blame and defame," Ryan said. "You see, if you don't have a good record to run on, then you paint your opponent as someone to run from." One question from the moderator, Martha Raddatz of ABC News, invited Ryan and Biden to decry the negativity of the campaigning. Instead, they engaged in more of it. 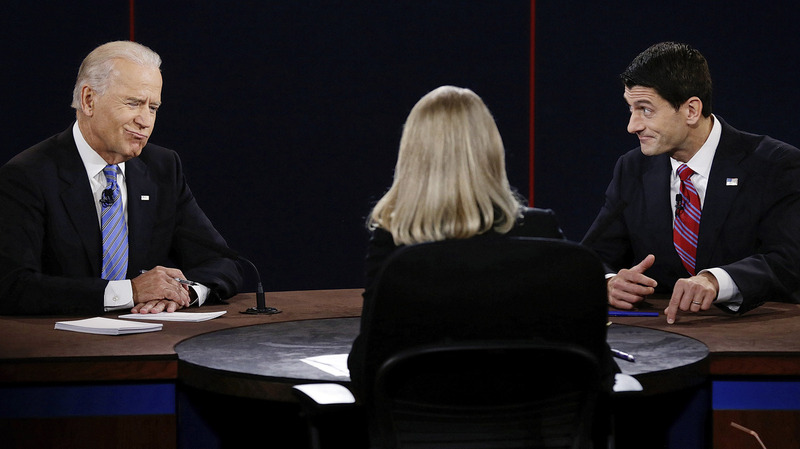 Still, in contrast to last week's presidential debate, Raddatz managed to steer much of the discussion. She moved the discussion quickly through a number of complicated topics. She didn't challenge the substance of the candidate's responses, but she did press them to be more specific and, at times, to stick to the subject at hand. She even asked Biden to elucidate his euphemistic phrase, "This is a bunch of stuff." He explained that it meant "malarkey." But the job of challenging what a candidate meant by any particular statement fell, typically, to the opposing candidate. Neither Biden nor Ryan let many statements go unchallenged. There have been previous debates that featured candidates seated close together at a table in a format that seemed to minimize personal attacks and bombast. This wasn't one of those occasions. Throughout the debate, Ryan and Biden insulted each other in subtle and not so subtle ways. In true senatorial fashion, Biden referred several times to Ryan as "my friend." But he didn't come across as a highly patient friend. "I have never met two guys who are more down on America across the board," Biden said of the Republicans. At times, Biden not only challenged the veracity and consistency of Ryan's responses but seemed to be heckling him, interjecting phrases during Ryan's time such as "that didn't happen," "that's a bizarre statement" and — shades of the 1988 vice presidential debate — "Oh, now you're Jack Kennedy!" Ryan, who referred repeatedly to Biden as "Joe," may have come to the Centre College stage in Danville, Ky., with a couple of pointed lines prepared at the vice president's expense. But Biden may have topped one of them with an ad lib. Ryan tried to explain away Romney's comments about the 47 percent by alluding to Biden's own widely noted proclivity for gaffes, saying, "I think the vice president very well knows that sometimes the words don't come out of your mouth the right way." Biden countered, "But I always say what I mean, and so does Romney." The last presidential debate, on Oct. 22, will focus on defense and foreign policy. Up to this point, however, the vice presidential discussion featured more substantive discussion of such issues than any other campaign event thus far. The two men seemed to express strong differences when it comes to levels of military spending and the U.S. posture toward countries including Iraq, Afghanistan, Libya, Syria and Iran. But when Ryan was pressed, he sometimes came up short in trying to explain how the Republicans would handle things differently than has the Democratic administration. On Syria, for example, Ryan complained that the Obama administration had wasted time by letting a U.N. envoy seek a deal with President Bashar Assad. It would have been better to work through allies in the region, he said, such as Turkey and Qatar to identify friendly forces within Syria. But he suggested that it would be a mistake to send in U.S. troops for humanitarian reasons. "Putting American troops on the ground, that's got to be within the national security interests of the American people," Ryan said. It's become a truism of campaign debates that body language matters — that how the candidates appear with the sound off matters as much as the substance of their remarks. There was certainly a stark contrast between the two men in terms of demeanor. Biden seemed to have two main forms of expression — laughter and anger. At times, he was openly frustrated with Ryan's comments, flashing a broad, toothy smile and all but rolling his eyes. Biden looked alternately puzzled and bemused as he listened to Ryan's characterizations of Obama administration policies. Biden embraced his role as the elder statesman on the stage, unabashedly touting his own long record in Washington by saying on several occasions that "I was there" when big deals were made years or even decades ago on tax cuts and Social Security policy. Ryan was occasionally wonky, talking repeatedly about a "status of forces agreement" in regard to Iraq. Most of the time, however, he emphasized his Midwestern roots, referring to a friend from his hometown serving in Afghanistan, or having viewed the ultrasound image of his first child at the hospital where he himself had been born. Ryan was consistently calm, sober and unblinking, but occasionally he appeared to silently seethe at Biden's remarks, showing a pained, dimply half-smile as he waited for his chances to respond. At one point, he objected to Biden's heckling by saying, "Mr. Vice President, I know you're under a lot of duress to make up for lost ground, but I think people would be better served if we don't keep interrupting each other."